Dr. Mike provides exceptional eye care in Parker and the surrounding areas. 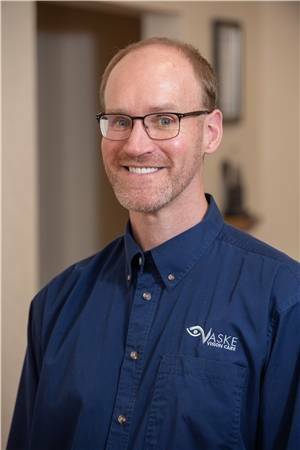 Dr. Vaske received his undergraduate degree in Human Biology from Mankato State University, and his Doctor of Optometry degree from the Illinois College of Optometry in Chicago. He is a member of American Optometric Association and the Colorado Optometric Association . He is also a member of the Parker Chamber of Commerce. Dr. Vaske is married to Danelle and they have 2 daughters, Cameryn and Rowynn. His interests include many outdoor activities like golfing, hiking 14’ers, road biking, and snowboarding. Dr. Vaske likes to give back to the Parker community by having his annual Good Deed contest. He awards special students whom have done a Good Deed in their community. Dr. Michael Vaske services Parker, Elizabeth, Aurora, Douglas County, Elbert County, and the Denver metro area. Walk-Ins welcomed. Click here for directions to our Parker, CO eye clinic.